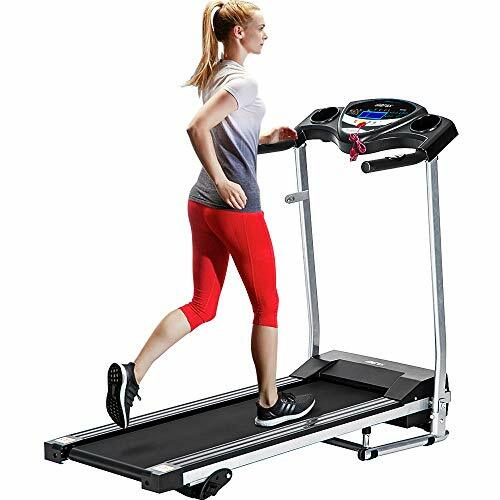 Merax Electric Folding Treadmill boasts a concise and classic design that features space-saving folding design yet reliable, sturdy frame for easy storage. Ideal for home use where space is a concern, and you won't compromise reliability for convenience with this running machine. A powerful but quiet motor is equipped to hold long distance running sessions and versatile enough to meet different exercise needs for all of your family members. The 4-layer running belt gives a nice springy feeling while running on the motorized treadmill, and ensures you to get the benefit of quiet operation and minimize stress on the motor. Tracking your progress, including time, calories, distance, speed, and heart rate becomes so readily with the super easy-to-use panel equipped. The preset programs alternate between high intensity and low intensity recovery periods to improve your aerobic capacity and burn calories after your workout. All of this plus a ONE YEAR warranti on frame and Motor to give you some peace of mind. This motorized treadmill has been adjusted into good condition before shipping. For daily use, regular maintenance and small adjustments are need for better performance. Running surface measures: 14" x 44"
If the running surface becomes too tight or too loose, turn the bolts near the end caps counter-clockwise will loosen the belt, and turn clockwise tighten the belt. Detailed photo instruction can be found in the manual.  Large LCD display tracks all necessary performance statistics including speed, time, distance and calories burnt to keep you focused on achieving your fitness goals during running or walking.  Safety & Durability-This running machine comes guaranteed with a Lifetime frame & motor warranty and a 1-year parts Warranty.